A few weeks ago, I shared a sneak preview of two new Dooney & Bourke collections being released this month at Disney Parks. Today, I’m excited to share additional details about a release party being held on July 22 in the Marketplace Co-Op at Disney Springs. 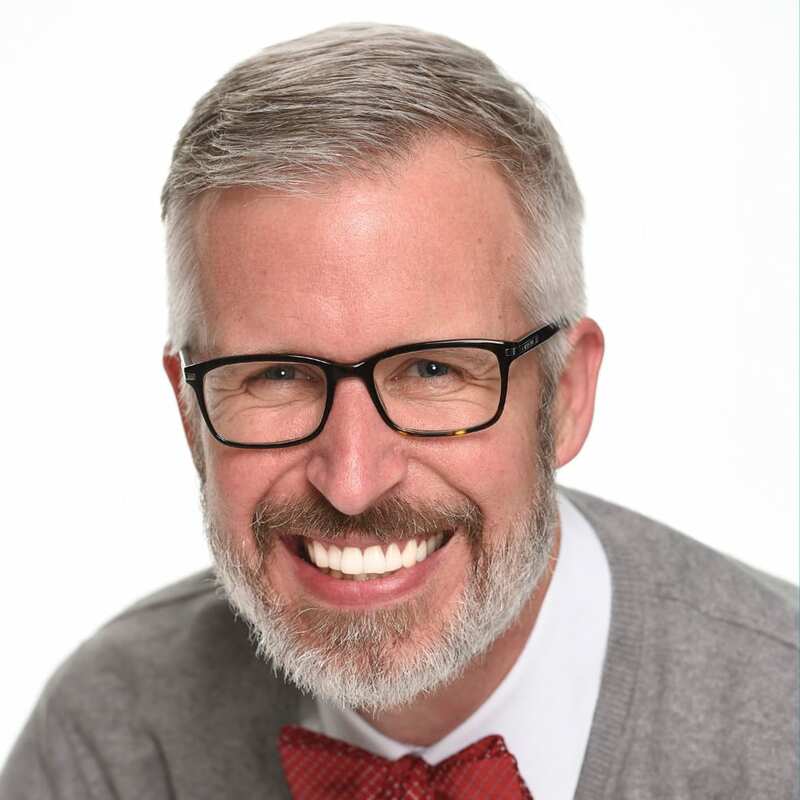 We will release two new collections, and guests can meet Ian Ray, Creative Director for Dooney & Bourke from 10:30 a.m. to 12:00 p.m. that day. I spoke with Angelique Vu, Merchandise Product Developer for Accessories, about her favorite new design. 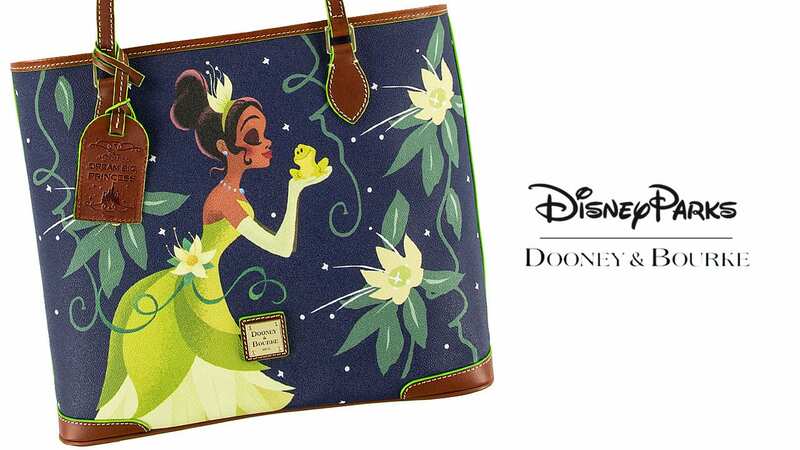 Artwork for the Princess Tiana handbags was created by Paola Gutierrez, Senior Graphic Designer with Disney Consumer Products and Interactive Media Creative Group. In addition to the Tote, a Crossbody and Foldover Crossbody will also be available. 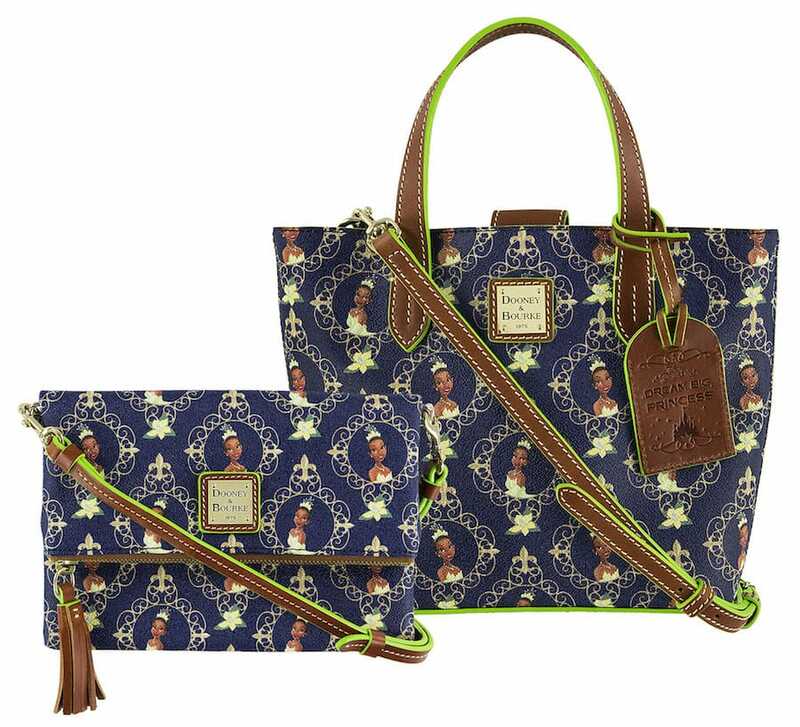 Paola also designed three handbags – Shopper, Lettercarrier, and Wristlet – inspired by The Haunted Mansion attraction. 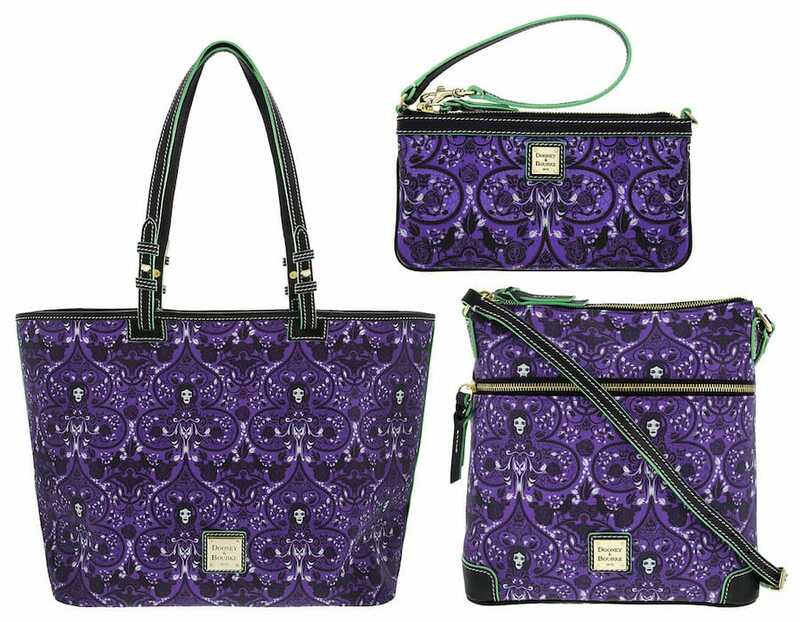 These purple handbags include images of Madame Leota and other icons from this classic Disney attraction. The Madame Leota design will also appear on a limited release retail MagicBand. Presented in a specially designed box and containing the innovation of MagicBand 2, guests can use it to unlock the magic of a Disney vacation – from effortless theme-park entry, FastPass+ redemption and Disney PhotoPass association, to skipping the front desk and going directly to your resort room. These items, with the exception of the retail MagicBand, will be released at Disneyland Resort on July 26. Guests may also find Dooney & Bourke handbags in select merchandise locations at Disney Parks, on DisneyStore.com, or via the Shop Disney Parks app. I would like to hear/know the full story behind Disney Dooney and Burke. Where might I find it? 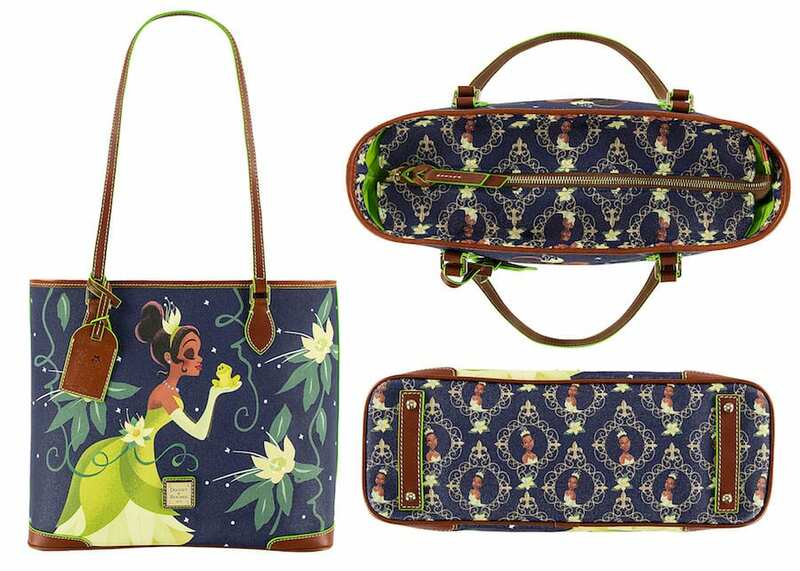 Are the Princess Tiana bags available for purchase currently? And if so, where? Will they be restocking the Madame Leota Magic band? I went to go and purchase, and it’s already sold out!? The MagicBand was also released at Disney’s Pin Traders and Marketplace Co-Op in Disney Springs; Uptown Jewelers on Main Street, U.S.A.; and Memento Mori in Liberty Square at Magic Kingdom Park. Do you know what time the madame leota collection magic bands and bags will be released on the shop Disney parks app? What time will the Haunted Mansion collection be available on the Disney Parks App and website? Can anyone attend the release party? Also, what time is it suggested to arrive? D&B needs to show Rapunzel some love!!! Do you have pricing of the Princess and the frog design? Is the Hahnted Mansion Magic Band made with leather at all? @John – We did not use leather to make the MagicBand. Will the Madame Leota design only be available for purchase at the Disneyland Resort on July 22nd, or will it also be available to purchase on that date at the Marketplace Co-Op at Disney Springs? @Manuel – These items will be released at Disney Springs on July 22. At Disneyland Resort, look for the handbags by July 26 (the MagicBand was created for Walt Disney World only). For Shop Disney Parks app and online store, look for the Madame Leota collection (including MagicBand) on July 24, and the Princess Tiana collection on July 31. Which store will the MagicBand will be sold at? Also will there be another Disney Parks Exclusive Funko Pop being released on July 20th? Cause last year Indiana Jones was released….. Thanks so much for the reply, Steven! Thanks for the additional information, Steven! Will the bags and MagicBand be available on the Shop Disney Parks app on the same date as the release party (if at all)? @Jennifer – For Shop Disney Parks app and online store, look for the Madame Leota collection (including MagicBand) on July 24 and the Princess Tiana collection on July 31. @Rachel – The retail is $48 (please note all retails are subject to change without notice).